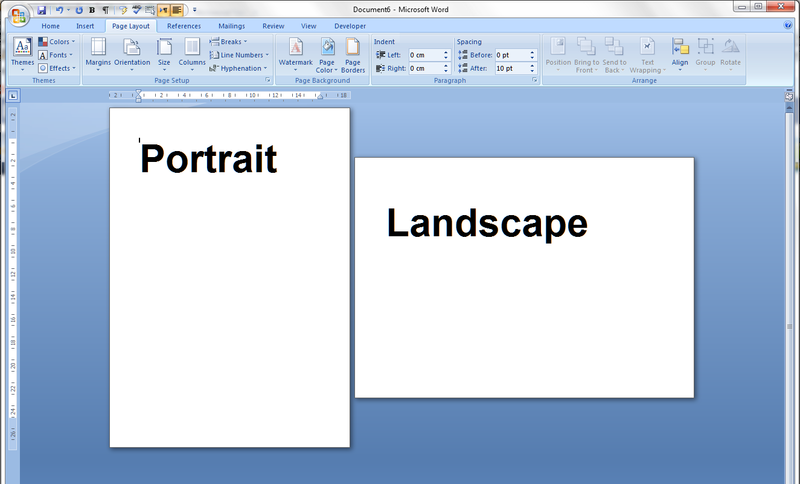 In this article, we’re talking about the Portrait and Landscape orientations in Word and Excel, what they are, why you might want to use each one, and how to swap between them. What are Portrait and Landscape? Portrait means that the page has the shorter sides at top and bottom. Think of a portrait in a gallery or museum. They are usually this way round. Landscape means that the page has the shorter sides on the left and right. Again, think of an art gallery. Which way round are views painted of the landscape? Exactly. Why would I want to use the landscape orientation? In the last three incidences, you might only want one page of the document to appear in landscape. That’s easily done, and you can find out how to have portrait and landscape in one document here. How do you change between Portrait and Landscape in Word 2007 and Word 2010? How do you change one page in Word to be in Landscape? How do you change between Portrait and Landscape in Excel 2007 and Excel 2010? Then press the Orientation button to make your selection. How do you change between Portrait and Landscape when you’re printing? Sometimes you don’t realise that you need to print your document in Landscape rather than Portrait (it’s usually this way around, I find) until you have printed out one copy and find that your lovely picture or table falls off the edge of the page. You can change the orientation of the printing while printing – however, the orientation of your original document will NOT change if you use this method, and if you want it to change to Landscape permanently, you will need to go back and follow the instructions I give above. Find choice buttons for Portrait / Landscape, select the one you want, and OK, and then your printout will be in that orientation. In this article we have learned what the portrait and landscape orientations are, why they are useful, how to change them in Word and Excel and how to change orientation when you are printing. If you have enjoyed this post, please share the link using the buttons below or sharing the Facebook, Twitter or LinkedIn alert that you followed to get here! I am inserting pictures into a document. The pictures on my computer are in the correct orientation….portrait. But when I insert one into the document it comes out in landscape mode and I can’t seem to change it. Any ideas that would help me? Hello there, I’ve just tested this in Word 2010 – let me know which version of Word you’re using if this doesn’t work for you. When you insert your picture, or if you click on it after you’ve inserted it and moved on, you will find an extra menu appearing in the ribbon, which has “Picture Tools” above it and shows a “Format” tab. There are three sections, Adjust, Picture Styles, Arrange and Size. In Arrange, there are three icons in a vertical row on the right of the section. The bottom one looks like two triangles facing one another. Click on that and you will be given the option to rotate the picture. I hope that helps – if it doesn’t, give me some more details and I’ll try to help! I am trying to print an excel document and I want it to be 2 sided with page one landscape and side 2 portrait. Is that possible? Thanks for your question. 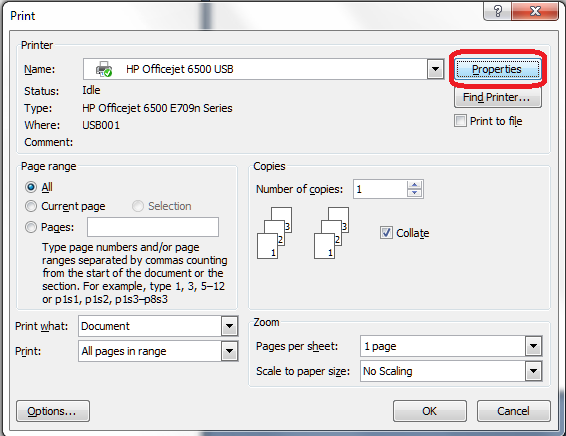 You should be able to mark one page as portrait and one as landscape as the instructions state, and then use the printer settings to make it print double-sided. Thanks Liz this has been helpful. Really this site is v .much helpful…thanks a lot. My portrait a4 is stuck side ways, so it looks like small landscape. I have tried to get it to stand in the right position but it will not change. How do I get it back to normal. Any help please? Have the instructions in the blog post helped you? If not, let me know what exactly does and doesn’t work, and I can try to help further. It would be useful to know which version of Word you’re using and whether it’s for Mac or PC. Have you tried this option, which is a last resort and will lose ALL of the formatting in your document? Highlight and copy all of your text. Open up a text editor (you should have Notepad on your PC under All Programs) and paste it into there so it’s just text, no formatting. Then copy that text and paste into a totally new Word document. The pages should all be correctly orientated now BUT this does lose all other formatting you might have in the document. Hi. I’m trying to print multiple worksheets (printing the entire workbook) with page numbers on each page (sheet), however some worksheets are landscaped and some are portrait and when I put pages numbers in; they auto change the format to all landscape. Is there a remedy? Because you don’t have section breaks in Excel, you will need to either import the spreadsheet into Word, where you can arrange it more easily, or add each section on a different sheet, which means you can orientate each sheet as you wish. I hope that helps! Hi Liz. I have a problem when I open a blank word document, the orientation is in landscape, however, when I go through page setup to orientate it back to portrait, an error message appears saying “increasing right margin causes last column to become too narrow in some sections having unevenly spaced columns”. It seems my default orientation is landscape and I cant change it to portrait. Any ideas? Thanks for your question, Danny. It sounds as though you’ve got a default template set up which has a table in it of some sort. The best thing I can suggest is to get the blank document as you want it (you might have to use the Paragraph Mark button to get it to show you the table so you can delete it, or highlight it and delete it), then save your new blank document as a Template (Save As and choose Word Template). Try to save it as the Normal Template if you can as this will restore what you want to being your default. I hope that helps! Hi, i have been trying to print a particular document in excel sheet in landscape orientation and this does not seem to work out for me, it is always coming out in portrait ,could it because the details are in page break preview? Thank you for your question. Have you followed the instructions in this post, which should enable you to change the orientation of the pages and print them in that way? yes i have tried all, the page lay out is in landscape orientation but as you print, it is printing as portrait.Is there any other process of changing the orientation? 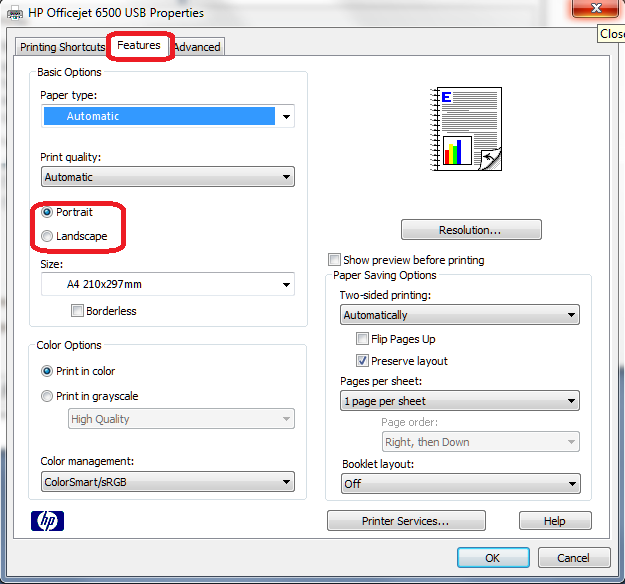 You will need to have a look at your actual printer settings in that case – these will differ by printer, but when you choose Print you should find something like Preferences or Options – go into that menu, maybe an Advanced Options menu, and find paper orientation and set that within the printer settings. That should stop the printer from over-riding the document settings. Ok. Thanks, though we’ve got other operating computers and they don’t behave the same otherwise i will check on that. Thanks so much Liz. The default printer settings will be unique to each computer, so it is perfectly possible for my solution to be the correct solution. Hello, I have a big issue, I use to see my documents when I attached to the subject line in an email in portrait format, but from a week ago it changed on me to landscape format. How can I reverse it back to the portrait? Do you mean you have to scroll along to read your actual email? I’m not sure what the question is here, but if you can clarify, I can try to help. which way should the spreadsheet be facing when you have a spreadsheet in landscape (2nd page) and a memo (1st page) in portrait? It’s completely up to you. But I’d use this rule: if the people are going to read it on a screen, have a potrait page then a landscape one so everything is the same orientation. If you’re printing it out, it won’t matter as they will turn it round anyway. I hope that helps.